What this recipe has going for it — bacon, banana, Blueberry Blast — could and probably should be emphasized with all the intensity of Jim from The Office pretending to be Dwight Schrute, coining the phrase, "Bears. Beets. Battlestar Galactica." 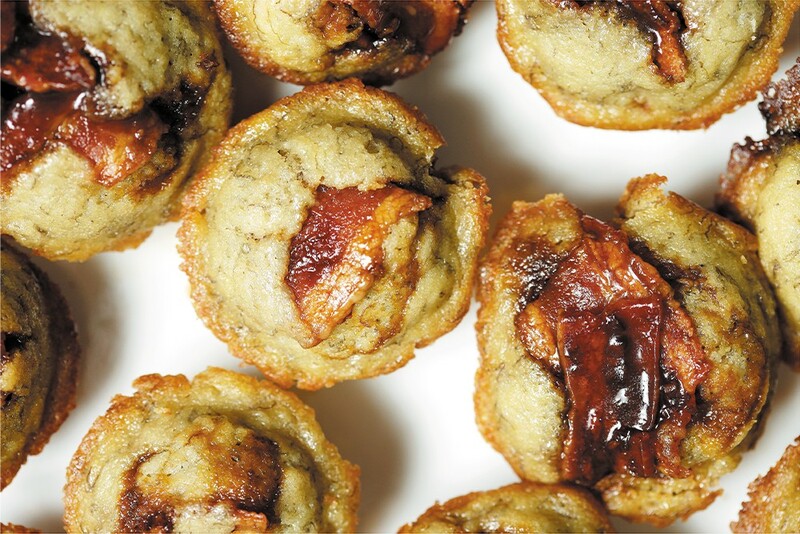 Not only is there bacon atop these mighty mini muffins, but that bacon is candied. And instead of melted butter or vegetable oil, this recipe subs in coconut oil infused with weed. You can make your own by heating ground-up bud and coconut oil in a slow cooker for 5-plus hours on low, then straining and saving it in the fridge or freezer for later. If all goes well, the marriage of tropical fruits helps dampen the grassy flavor of the weed, while the salty-sweet combo of the candied bacon delights the taste buds. This recipe should net you about 24 to 30 mini muffins, which you can freeze in an airtight container and reheat later as wanted. As always, until you know how strong your oil or edibles turn out, start with a very small portion and wait up to a few hours for the full effects to hit you before trying more. Better to go under-board than over. In a large bowl, stir together weed-infused coconut oil with sugar, then add the vanilla extract and sour cream, stirring until smooth and uniform. Sprinkle baking powder, baking soda and salt over mixture, and stir to combine. Then add half a cup of flour at a time, stirring until just combined. Add in the bananas until mixed, and set aside for a moment. For the candied bacon, put 3 tbsp of butter in a large nonstick skillet on medium low, and just after the butter is melted and starting to bubble, add in the brown sugar. Turn the heat up to medium and stir the mixture constantly with a heat-proof spatula or wooden spoon until it starts to bubble up and change color. Add the bacon bits, turn off the heat, and stir quickly to coat the pieces of bacon in the mixture before it starts to cool, then spread pieces on a baking sheet so they're separated. The original print version of this article was headlined "Get Baked: Bacon Banana Muffins"